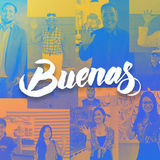 Mission: To improve the care of all animals on Guam by sheltering those in need, and through compassionate advocacy, expert education and strong community connections. What they do: GAIN, the only animal shelter on Guam, operates in Yigo providing care for dogs and cats by providing food, shelter and basic needs. The agency also works to find permanent, loving homes for Guamâ&#x20AC;&#x2122;s homeless and abused animals through their adoption and foster programs and strives to educate the community in responsible pet care. GAIN has also recently expanded to providing low-cost spay and neuter services at the Raulerson Spay & Neuter Clinic located at the shelter as well, with the help of local and regional volunteer veterinarians. Executive Director: Alison Hadley Phone: 653-4246 Clinic Phone: 653-6717 Email: info@guamanimals.org Clinic Email: snip@guamanimals.org Website: guamanimals.org Facebook: facebook.com/guamanimals Foster Facebook Page: facebook.com/groups/GAINfosters Instagram: @guamanimals How to volunteer: To sign up for volunteer opportunities, visit timecounts.org/gain, log onto guamanimals.org, email or call the GAIN office. 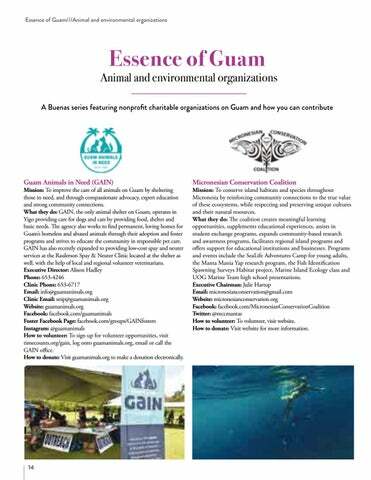 How to donate: Visit guamanimals.org to make a donation electronically. Mission: To conserve island habitats and species throughout Micronesia by reinforcing community connections to the true value of these ecosystems, while respecting and preserving unique cultures and their natural resources. What they do: The coalition creates meaningful learning opportunities, supplements educational experiences, assists in student exchange programs, expands community-based research and awareness programs, facilitates regional island programs and offers support for educational institutions and businesses. Programs and events include the SeaLife Adventures Camp for young adults, the Manta Mania Yap research program, the Fish Identification Spawning Surveys Habitat project, Marine Island Ecology class and UOG Marine Team high school presentations. Executive Chairman: Julie Hartup Email: micronesianconservation@gmail.com Website: micronesianconservation.org Facebook: facebook.com/MicronesianConservationCoalition Twitter: @mccmantas How to volunteer: To volunteer, visit website. How to donate: Visit website for more information.